It was 1974, Xi’an, China and one of the most phenomenal archaeological discoveries ever occurred. It was the moment when more than 8000 full scale warriors cast of clay were reintroduced to the world after hiding for over two millennia. 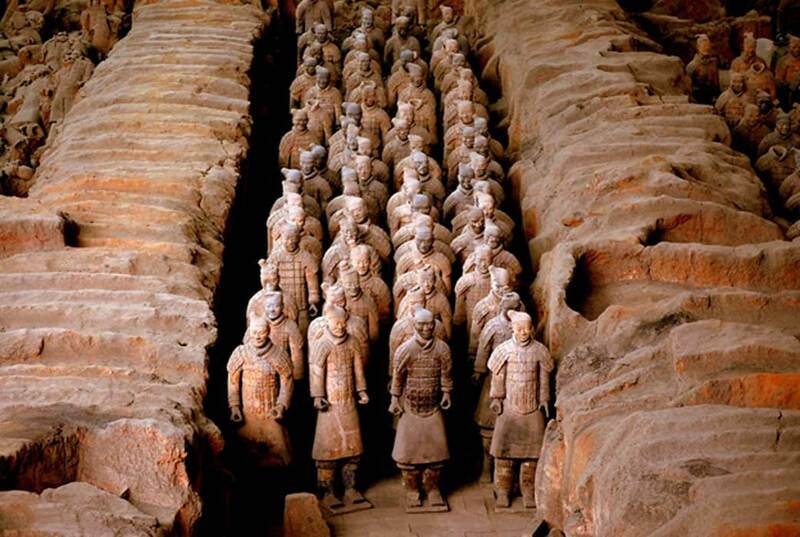 The vast army in waiting would become known as the ‘ Terracotta Army’ . The warriors themselves were skillfully sculpted from clay. It was not until almost three decades after the initial discovery that research revealed that the weapons the army had been provided with were real and not replicas. What’s more, they were state of the art, with the crossbows being powerful enough to pierce contemporary armor and kill opponents with a single bolt. The terracotta army is now around 2,200 years old and is located at what might rightly be considered the greatest mausoleum in the world, that of Emperor Qin Shi Huang, known as First Emperor of unified China. The mausoleum complex essentially recreated the Emperors living environment ready for the afterlife. It is supposed that the purpose of the army was to ensure the eternal safety of on his journey in the afterlife. They are found as part of the huge complex covering 19.3 square miles (50 sq km). They were equipped with the latest weaponry, which would allow the army to effectively defend their king. 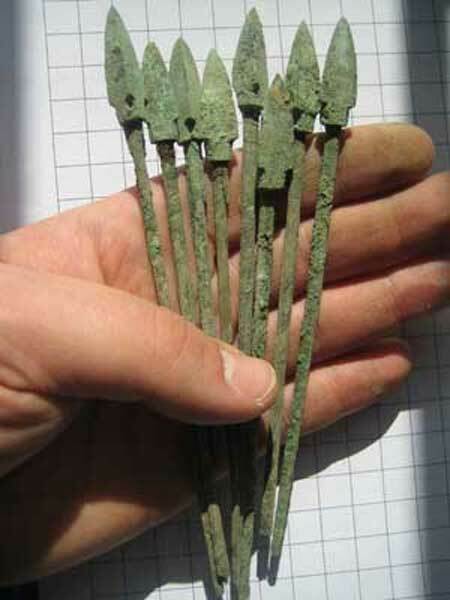 According to an Archaeology International article , in excess of 40,000 bronze weapons were recovered with the warriors. Arrowheads were by far the most abundant weaponry to be found. They were in bundles of 100 units which are thought to represent the contents of a single crossbowman's quiver. Each arrow was composed of the triangular pyramid-shaped projectile point, and a tang which assisted the point's snug insertion into a bamboo or wood shaft, with a feather attached at the distal end. The metallic components of the arrow (ie. the arrowhead and the tang) are the only parts that were preserved. Scientists from the University College London and the Terracotta Army Museum reproduced arrowheads from 200BC when the Terracotta Army was built and tested them with a crossbow of that period. The results showed that the arrows easily pierced through the armor used in 2 nd century BC in China and would have been capable of inflicting a fatal blow. “These crossbows were two millennia ahead of their time,” said Mike Loades, historian and expert in ancient weapons. These findings amongst others were broadcast on a documentary ‘ New Secrets of the Terracotta Warriors’ on the UK’s Channel Four.